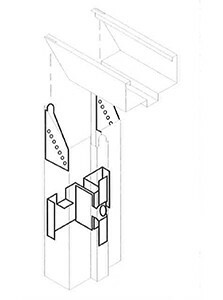 Standard and custom jamb depths with various profiles. 3 piece drywall frames available in 16 gauge & 18 gauge for use in pre-finished or unfinished drywall. The 18DW group is made in 18 (1.2mm) gauge, the 16DW group is made in 16 (1.5mm) gauge. Fire rated frames shall be tested in accordance with ASTM, NFPA and UL standards and carry the mark of and be listed by an independent, recognized and accredited laboratory.